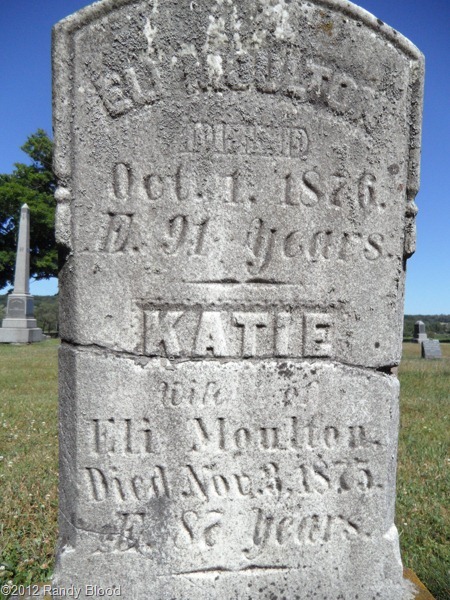 I found have a nice picture of the headstone for Eli Moulton at Find-A-Grave (Memorial #10167576). He is buried in Greenwood Cemetery, Stockton, NY. The photos at Find-A-Grave are copyright protected. I am not using the photo directly in this blog for that reason. His name and age match with the person found in the 1875 NY State Census discussed in my last post. As an added bonus, the stone names his wife, her death date, and her age at death. This allows me to expand my knowledge of the family by one additional person. Additional data found on Eli’s memorial page at Find-A-Grave is not sourced, so I question its reliability. Parents are named for Eli and I have found the same information in dozens of trees online. However, I have not found a single reference that provides a source for this identification. One statement on Katie’s Memorial (#10167583) page is certainly incorrect. It states “she is documented in Tribal records as wife of Eli Moulton”. I have asked the creator of the page to correct this statement, but months later the statement is still there. A statement describing Metallic’s daughter as being the wife of Eli Moulton is found on our Ne-Do-Ba website, but this is unsourced hearsay. Our website does not pretend to represent any specific tribal community nor to offer official tribal records. My years of research has found no record or proof of this marriage in any public or tribal records. I hope to change that as a result of this research project, but until I do, this must be classified as local legend and hearsay. I will continue to search for vital records online for both Eli and Catherine in hopes of learning more about their place of birth, children, and parents. If I don’t discover enough of value, I will probably hire a researcher through GenealogyFreelancer.com to visit Stockton and/or the Chautauqua County seat in search of vital records for the couple.